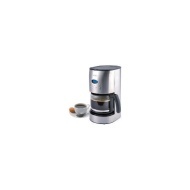 alaTest has collected and analyzed 11 reviews of Tricity TCM09 Coffee Maker. The average rating for this product is 4.7/5, compared to an average rating of 4.4/5 for other products in the same category for all reviews. Reviewers are impressed by the price and performance. The maintenance and design are also appreciated, but many are critical about the capacity and size. We analyzed user and expert ratings, product age and more factors. Compared to other products in the same category the Tricity TCM09 Coffee Maker is awarded an overall alaScore™ of 82/100 = Very good quality. It makes excellent coffee exactly the strength you choose to have it and will even have it ready for a certain time. You can make from two cups to a big jugful. The hotplate keeps it hot without over-heating it. A very minor one: You need to be careful pouring the water in to make sure it goes into the resevoir and nowhere else but it's easy once you realise how to do it. Very easy to use and to keep clean. Also makes great coffee. timer is brilliant couldn't live with out it now..
Easy to use, good styling, not too large. Wonderful machine - setting the timer for coffee is simple, as is using the 'aroma' function to produce better tasting coffee (so the instructions say, I'll take their word for it). Pouring water into the tank is easy if you use a jug, I imagine things could get quite messy otherwise!